The dawn of 1961 ushered in a new era in the history of Pakistan. The age old Ana denomination was replaced by the decimal system as Pakistan switched over to the metric system. Now instead of One Pakistani Rupee having 16 Ana or 64 Paisa, from 1 January 1961 was to equal 100 paisa. Since there were no readily available stamps of decimal system, the stamps issued in previous years were overprinted with the new price in paisa. 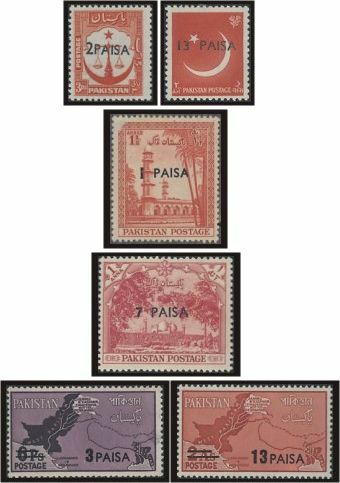 The stamps with paisa overprint that were used were as shown above: the Justice Scale series of 1948 re-priced 2 Paisa, the Crescent stamp 1956 re-priced 13 Paisa, the Badshahi Mosque re-priced 7 Paisa and Jahangir Mausoleum 1954 re-priced 1 Paisa and West Pakistan map series of 1960 re-priced 3 and 13 Paisa. From 1961-63, a series of definitive stamps was issued, but in the earlier issues, the word "Pakistan" was erroneously written as "Shakistan" in the Bengali text as in the above series of stamps. The mistake when observed, was later corrected in the stamps as shown herein under. This is the corrected series of stamps with Pakistan correctly spelt in Bengali text. The stamps showing the famous Khyber Pass were of the denomination of Paisa 1,2,3,5 and 7. Continuing with the definitive series of stamps between 1961-63, the second set of stamps bore the photo of the famous Mogul architecture of Shalimar Gardens of Lahore. The stamps were of Paisa 10,15,25,40,50,75 and 90 denomination. The next set of defintive stamps was a set of four stamps showing the entrance of the famous Chhota Sona Mosque of East Pakistan (now Bangla Desh). The stamps were of 1, 1.25, 2 and 5 rupees denomination. 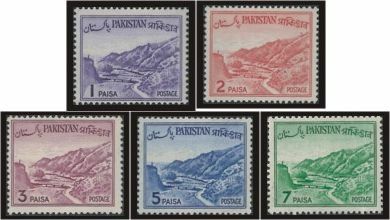 On the eve of the Lahore Stamp exhibition, the earlier issued stamp of West Pakistan map was overprinted with Lahore Stamp Exhibition 1961 and was issued on 12th February 1961 as seen above left. The stamp on right above was issued on 1 July 1961 on the eve of completion of Warsak Hydro Electric Project - the first ever project of Pakistan to produce electricity by constructing a dam on Kabul River near the town of Warsak, Peshawar. The stamp had a face value of 40 Paisa. On 2 October 1961, a set of two triangular stamps (above top row) was issued on the eve of the Child Welfare Week. The turquoise blue stamp had a face value of 13 Paisa, while the bright purple stamp was priced at 90 Paisa. On 4 November 1961, a set of two stamps (above bottom row) on the Cooperative Day. 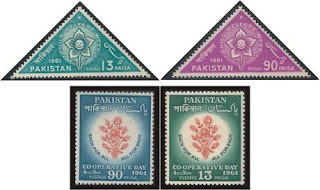 The rose red and deep green stamp (right) was priced 13 Paisa, while rose red and blue stamp (left) had a face value of 90 Paisa. On the eve of the Police Century on 30 November 1961, a set of two stamps (above) was issued bearing the Police crest and Traffic Control. The silver black and blue stamp (above left) was priced at Paisa 13, while the silver black and red (left) was priced at Paisa 40. The last stamp to be issued in 1961 was on the eve of the Railway Centenary (1861-1961), which were issued on 31 December, the last day of the year 1961. 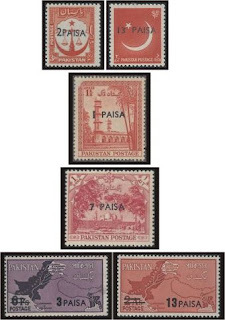 The 13 Paisa stamp on the left above showed a steam locomotive engine (known as Eagle)that pioneered the commencement of railways system in the Indo-Pakistan subcontinent. The 50 Paisa denomination stamp on the right above showed a diesel locomotive engine.